This ingenious stereo tuner-amplifier module is the same size as a double mains socket and is designed to fit into a surface or flush-mounted wall box. The KLAB20D includes a FM-only tuner with 10 presets, auxiliary inputs and an efficient 20W per channel Class 'D' amp. One of the auxiliary inputs is a 3.5mm socket, accessible from the unit's front panel and thus ideal for plugging in iPods, personal CD players and so on. 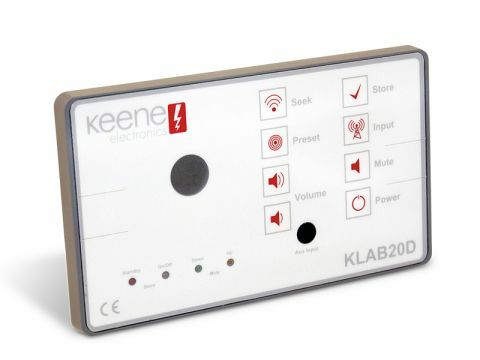 The basic operating controls take the form of membrane keys, which are resistant to wet fingers and everyday grime; however, the KLAB20D isn't designed for use in damp environments (it's not IP-rated). A remote control handset is also supplied. Bass, treble, loudness and balance controls are available in a 'setup' mode. You can thus adjust the tone to suit your speakers and listening material. There are also 10 volume levels that can be preset. Also, being 25mm deep it may neatly screw onto a double wall box, but the supplied 15V power unit doesn't. The latter is of roughly the same size and shape as a laptop type.